Dr. Leonard Ginsburg is chairman of the Moore Eye Institute, which recently partnered with Drexel Medicine to provide patients with the highest quality eye care. Dr. Ginsburg joins Drexel University College of Medicine as clinical chief of the Department of Ophthalmology. 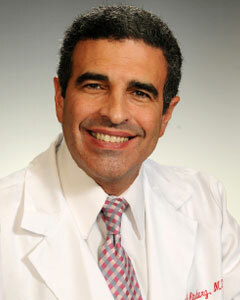 He is a Harvard University trained retina surgeon whose areas of expertise are diabetes and macular degeneration. He's also a certified diabetes educator. For those of us who simply know you as Dr. Ginsburg, can you tell us a little bit about your life before medical school? I grew up in Delaware County and went to high school at Haverford Senior High School. My whole family is from Philadelphia. I love it here. After high school, I went to University of Pennsylvania for undergraduate and medical school. My grandfather, who was a family physician in South Philadelphia, was awarded with the University of Pennsylvania Medical School's Ideal Physician award. My grandfather was my role model. He was a family physician in South Philadelphia. His patients were his life. When I first got to Penn I noticed there wasn't much of an advising program for undergraduates, so I approached the dean and I started Students Helping Students, which matched upperclassmen with freshmen according to major. Other universities heard about it, and I helped set up Students Helping Students at Harvard University and Brown University. Before long, we decided to have a student government organization to connect all of the Ivy League schools. This group later became the American Association of University Students (AAUS). Now at the time, the Internet did not exist, but I met someone at Harvard who was brilliant with computers. By linking all the major universities in the U.S. together through computers, we knew that so much could be accomplished and we ended up presenting that idea to the chief scientist of IBM in New York. After some time, we ended up gaining much support from universities around the world for this international network for university students. It culminated in 1985, when I had the honor of chairing the student section at the International Association of Universities convention that represented 800 universities in 120 nations. This sharing of ideas in education became a passion of mine. For a moment, I questioned what path to pursue, but ultimately knew medicine was my true passion. When you decided to go into medicine, what made you choose ophthalmology? My grandfather delivered over 3,000 babies in South Philadelphia. I initially wanted to deliver babies like him. I went to school thinking I would go into obstetrics and gynecology. That was my plan through my fourth year of medical school. It wasn't until at an AMA convention that the chairman of Will's Eye Hospital met me while I was serving as the national vice chairman of the medical school section. He asked if I ever considered going into ophthalmology. I told him I hadn't considered it because after seeing my grandmother suffer from macular degeneration and my grandfather lose his vision from diabetes, I was afraid of losing my own vision and never considered being an eye doctor. In the end, he still encouraged me to look into it and I ended up doing a rotation at Will's for a month. About a week before the deadline to apply for ophthalmology residency, I decided to make the switch from obstetrics and gynecology, which is pretty rare to do at such a late stage. As a retina surgeon with expertise in diabetes and macular degeneration, would you say your grandparents' illnesses played a role in choosing your career path? Moore Eye Institute is named after my grandmother, Belle Moore. She was alive to see its formation, which is special to me. I name everything after my grandmother, even my daughter Belle. When I was younger, I had taken my grandmother to a number of doctors in Philadelphia, and they all told us there wasn't much they could do for her. I'll never forget when I was 16 years old and my grandmother told me she couldn't see my face. It just tortured her. She just couldn't see her grandson's face. I asked the eye doctor why, and he told me there's nothing they could do for her and he just walked out on me. I didn't really appreciate that. I didn't see him as a caring doctor. So I took her to Harvard to Massachusetts Eye and Ear, and there was a great retina surgeon who also worked as a low-vision doctor. They spent hours giving her magnifying glasses. They decided to do cataract surgery, and for a year of her life starting the day after surgery, she could see my face. Afterwards, we were both crying, and it was at that point that I knew I wanted to be a physician. My grandfather was treated for his diabetic eye disease also in Boston at the Joslin Diabetes Center. As I said, I planned to go into obstetrics, but after the rotation at Will's and deciding on ophthalmology, there was no turning back and I knew I had to be a retina doctor like the one who helped my grandmother. Also worth mentioning is that the doctor who helped my grandmother is the same doctor who I would later train with during my fellowship at Harvard and subsequent training at Joslin Diabetes Center. It was at Joslin that I became a certified diabetes educator and learned the team approach to diabetes, which served me well, as I later became the director at two diabetes education centers. The top concern of patients with diabetes is the possibility of losing their vision. Since 76% of all complications can be prevented through tight blood sugar control, my passion has been to motivate, teach and empower. It's important to me to help motivate patients to take care of themselves. Technology seems like it's always been an interest of yours. How have you incorporated that into your medical practices? After returning to Philadelphia, I founded the Retina and Diabetic Eye Institute at Mercy Community Hospital. Within five years, it became one of the largest retina centers in Philadelphia. We were the third place in America to use digital ICG angiography, the third most important diagnostic test for macular degeneration, which is the leading cause of vision loss in America over the age of 65. After that, I moved on to Crozer-Keystone Health System where we started the Moore Eye Institute. Crozer-Keystone purchased an optical coherence tomography (OCT) for Moore, which was the first in Pennsylvania. OCT is now by far the most important diagnostic test in all of ophthalmology and the best way to follow macular degeneration and diabetic macular edema. Moore played an important role in bringing two of the three most important tests for macular degeneration and diabetes to the state of Pennsylvania. Are there many illnesses that can be diagnosed in the eye? Many systemic conditions can be seen in the retina. Diabetes, hypertension, atherosclerosis, collagen vascular diseases, blood disorders, and infectious diseases such as Lyme, tuberculosis, syphilis, and many other conditions can present in the eye. Eyes aren't just the windows to the soul; they're windows to the whole body. That's why it's important for ophthalmologists to work with all the other specialists. Why did you decide to partner with Drexel? When Drexel approached me to work together, I saw an opportunity to continue Moore's dream by not just treating patients' eyes, but helping to treat the entire human being. There's the opportunity here to partner with all specialties and explore the possibilities of a multi-disciplinary diabetes center. Also, public health is very important to me, and Drexel's School of Public Health is one of the best. Public health helps physicians understand and reach out to all types of patients no matter their ethnicity, culture, or religion, which are important to know when treating someone. Understanding the human being is at times even more important than treating just the disease. We, the doctors, serve the public and must treat each patient as a unique human being and not just as a disease or a set of eyes. I joined Drexel because I believe they really care about the patients they see and the students they teach. I have worked and trained at some of the finest institutions in the world from Harvard to Penn and even internationally at Oxford and Tel Aviv, but I have never seen a medical school with such heart and caring. If I can play a small role in building further passion here, then it will be my honor to do so. I feel privileged to be part of the Drexel team. I know that together we will give our patients the best possible care. That's why I'm here.